New Year's day was a "rest" day for me. It was still a little cold and muddy outside so I didn't do a bike ride, I didn't run even though I kind of wanted to get up the motivation to do a run and I didn't lift any weights. I haven't completely formulated my goals for 2014, they are fairly undefined right now but one goal is to do a real pullup with no bands and no help. I feel like I'm very far away from this but since Jan. 2nd, I've done pullup exercises. So for two days straight now, I've done assisted pullups, first with Jason and then with a band and I've done negative pullups where I get my chin up to the bar and then try to slowly lower myself down. The goal is to do some sort of pullup exercise every day! Even if it's only 5 banded pullups and 5 negative pullups. We'll see how long it takes me to get to a real pullup with this level of effort and commitment. Tabatas! Start with the first exercise, do as many reps in 20 seconds, rest 10 seconds, repeat for total of 8 times, then rest 1 minute and move on to the next exercise. The only round that "counts" is the your round with your lowest reps.
Push press 55 lbs = 8, a total of 64! 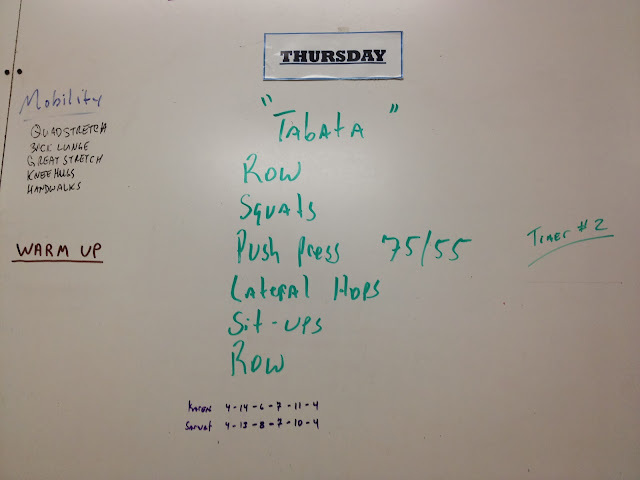 I was pretty consistent in these tabatas- for the row for calories, I did 5 the first round but after that it was not possible. Everything else was within 1 rep. 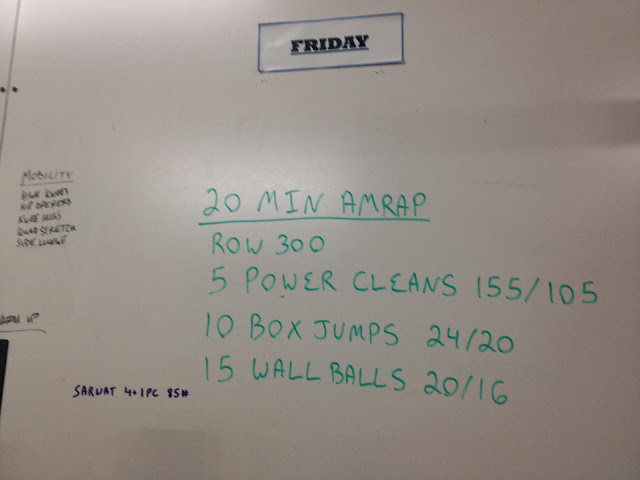 Besides being alone on Friday, I had a hard time with the power cleans, my legs just didn't feel strong. I did 4 rounds plus 1 power clean! I struggled with the power cleans today, I am definitely someone who falls into the "if you don't use it, you lose it" category. I haven't been doing my cleans and it showed today!